Climate change adaptation is the strategy of changing social and ecological modes of being to reduce the harmful effects of climate change. It involves changing society and the ecosystems so that the effects of climate change will not be as significant or severe. One approach to adapting to climate change is taking advantage of positive effects of climate change. For example, warmer climates will increase agricultural productivity in parts of the northern hemisphere, such as Scandinavia, because of longer growing seasons and less permafrost-covered area. 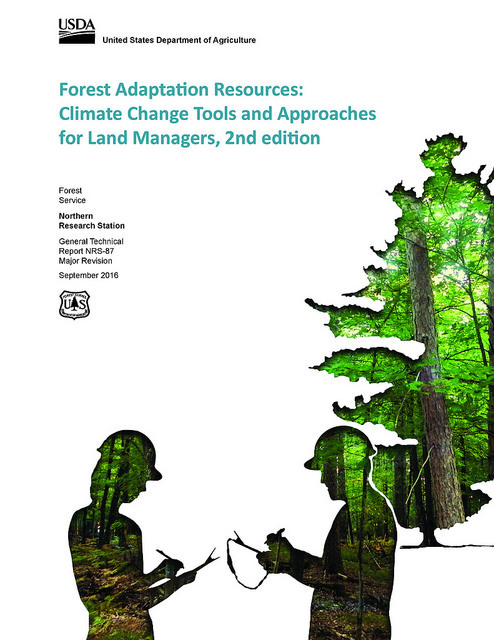 Another means of adaptation is preparing for the negative effects to climate change. This includes building seawalls to reduce the effects of sea level rise in coastal cities like New York City, Shanghai, and Amsterdam. Cities in areas where floods are increasing in frequency have taken to designing roads and sidewalks that are more water absorbent to mitigate the effects of floods. Most climate scientists believe that at least some climate change adaptation is going to be required since even if all carbon emissions ceased today, there would already be enough greenhouse gases added to the atmosphere to cause significant changes. Climate change mitigation strategies work to reduce or prevent climate change itself so that society and ecosystems do not have to adjust as much to flourish under the new climate regime. Mitigation can still require a change in lifestyle since mitigating or reducing climate change also means reducing behaviors or processes that are leading to climate change. Some of the earliest political and economic responses were effectively mitigation. 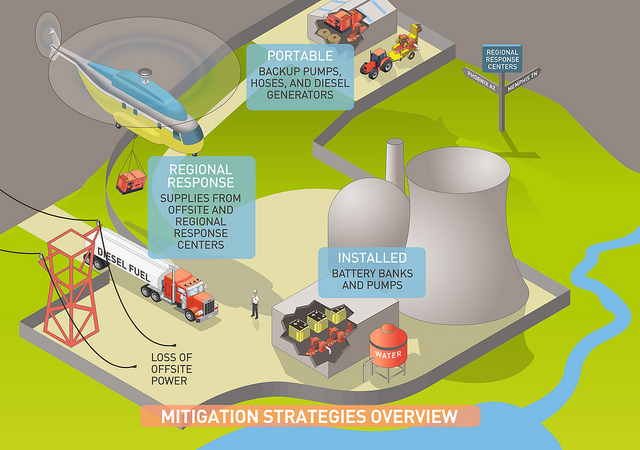 This mitigation is related to reducing greenhouse gas emissions, namely carbon emissions, which are the primary driver of modern global climate change. Although there are also natural sources of greenhouse gas emissions, volcanic eruptions for example, the majority of greenhouse gases emissions today are produced by human activity. This includes livestock, factory emissions, and automobile emissions. Most mitigation efforts involve reducing these sources. Many large cities such as New York City and Seattle are investing in public transportation to reduce the use of automobiles which are a common source of carbon emissions. Meanwhile many cities and individual homeowners are being encouraged to turn to alternative sources of power such as solar and wind power to become less dependent on natural gas and other fossil fuels for energy. Since livestock, particularly cattle, have also been linked to increased greenhouse gas emissions, some experts have suggested consuming less meat to mitigate climate change. In addition to reducing carbon emissions, scientists, inventors, and municipal leaders have also suggested enhancing parts of the environment that absorb carbon dioxide and other greenhouse gases. One example of enhancing a carbon sink is growing more trees. Removing carbon dioxide from the atmosphere and trapping it somewhere such as beneath the ocean has also been proposed. One proposal is to capture carbon dioxide emitted from factories and store it so that it does not enter the atmosphere. The focus of this approach is finding ways to directly sequester or remove greenhouse gases from active natural cycles. These techniques can be as low tech as increasing the average vegetation in major cities, especially trees, to take in more carbon dioxide, or very high tech. Both adaptation and mitigation are responses to climate change intended to reduce the harmful effects it might have on the current society and the global biosphere. They also require modifications to the current way that energy is used and consumed as well as the way that communities are built. They are also both very controversial in some contexts. 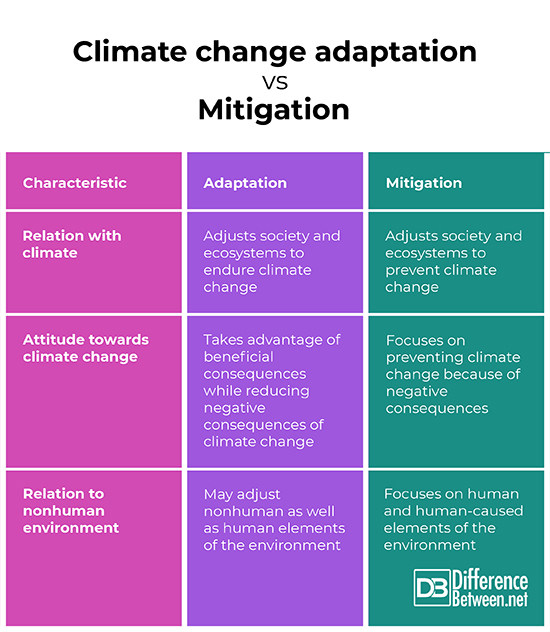 Although there are similarities between climate change adaptation and mitigation there are also significant differences which include the following. Climate change adaptation attempts to reduce the negative effects of a future climate change without necessarily preventing the climate change itself, whereas mitigation seeks to reduce the negative effect of climate change by preventing climate change or reducing the degree to which the climate changes. Adaptation also takes advantage of the positive ways that climate change may affect society whereas mitigation focuses on preventing the negative effects. Adaptation may also involve modifying non-human ecosystems to make them more resistant to the effects of climate, whereas mitigation usually only involves the human aspect since humans are assumed to be the primary cause. Climate change adaptation involves adjusting society and ecosystems so that they will not be as severely affected by negative consequences of future climate change. Examples of climate change adaptation include building seawalls and designing more water absorbent pavement for roads to mitigate the effects of flooding. Climate change mitigation involves preventing climate change from happening in the first place to prevent harmful consequences. Examples include designing cars and cities to use less energy as well as alternative forms of energy that do not require fossil fuels that produce carbon emissions. Climate change adaptation and mitigation differ in that climate change adaptation adjusts society and ecosystems to endure climate change while mitigation adjusts society and ecosystems to prevent climate change. Adaptation also seeks to take advantage of any positive effects of climate change whereas mitigation focuses on preventing the negative consequences. Furthermore, climate change adaptation may also modify the natural ecosystems as well, whereas mitigation will focus on the human elements since anthropogenic carbon emissions are the primary cause of modern global climate change. Caleb Strom. "Difference between Climate Change Adaptation and Mitigation." DifferenceBetween.net. September 18, 2018 < http://www.differencebetween.net/science/difference-between-climate-change-adaptation-and-mitigation/ >. Olesen, Jørgen E., and Marco Bindi. "Consequences of climate change for European agricultural productivity, land use and policy." European journal of agronomy 16.4 (2002): 239-262. Berrang-Ford, Lea, James D. Ford, and Jaclyn Paterson. "Are we adapting to climate change?." Global environmental change 21.1 (2011): 25-33. Change, IPCC Climate. "Mitigation of climate change." Summary for Policymakers 10.5.4 (2007). Garnett, Tara. "Livestock-related greenhouse gas emissions: impacts and options for policy makers." environmental science & policy 12.4 (2009): 491-503. Clemens, Joachim, et al. "Mitigation of greenhouse gas emissions by anaerobic digestion of cattle slurry." Agriculture, ecosystems & environment 112.2-3 (2006): 171-177. McMichael, Anthony J., et al. "Food, livestock production, energy, climate change, and health." The lancet 370.9594 (2007): 1253-1263. Wang, Meihong, et al. "Post-combustion CO2 capture with chemical absorption: A state-of-the-art review." Chemical Engineering Research and Design 89.9 (2011): 1609-1624. Caldeira, Ken, and Greg H. Rau. "Accelerating carbonate dissolution to sequester carbon dioxide in the ocean: Geochemical implications." Geophysical Research Letters27.2 (2000): 225-228.